History Of The Bill Turner Cup. In 1979, a group of dedicated teachers who were greatly involved in school soccer, decided to introduce a 15 years and under competition. This committee was known as “Northern NSW Schools Soccer” and was chaired by Bill Turner. Bill, a teacher at Booragul High School (now Lake Macquarie High, NSW, Australia), had worked tirelessly in school and youth soccer for many years, and was a well regarded referee. The Cup commenced with a modest 34 entries from the state and private schools in the Newcastle and Lake Macquarie region, with Belmont and Whitebridge meeting in the final at Crystal Palace Ground, Wallsend. In Sydney, a 15 years competition with 64 teams was commenced by John Moscovis and sponsored by Radio Station 2SM. The 1982 Sydney winner entered the Bill Turner Cup at the Semi-final stage. When the Sydney competition folded as a separate entity in 1983, it became a full part of the main competition and the limit of 64 entries was lifted. The Bill Turner Cup was fully endorsed by Soccer Australia in 1995, Queensland and ACT in 1996, Soccer NSW in 2000 and the Football Federation Australia has continued the endorsement. So popular and prestigious became the competition that schools from five eastern soccer states Northern NSW (1979) NSW (1981), ACT (1982) Queensland (1987) and Victoria (1988) have entered. Currently, the Pilot competition in Western Australia is in recess. In 1988 a wonderful era of development began when the Commonwealth Bank became the competition’s major sponsor and remained so for nine years. Their advice and sponsorship was greatly appreciated and aided the remarkable development of the competition. In 1996 another perpetual trophy was initiated, named the “Terry Hampton Shield.” This honours one of the long serving administrators of the competition, and is presented to the finalist of the Cup. After taking over the girls’ competition in 2000, the Executive committee renamed it the Bill Turner Trophy. The losing Finalist is awarded another perpetual trophy, the “Lindsay Hewison Shield.” Lindsay is another teacher, who has been outstanding in school and youth football. Lindsay is the current president of the Executive Committee that runs the Bill Turner Cup and Trophy. History Of The Bill Turner Trophy. In 1990 Ron Pratt and Sue Andrews of Combined High Schools were approached to introduce a knockout competition for Junior Girls. With the cooperation of the NSW Soccer Federation such a competition began in 1991 with Bass High the first winners. In 1994 and 1995, Lindsay Hewison and Warren Sheelah organised the competition, with Louise Yates taking over in 1996-1999. 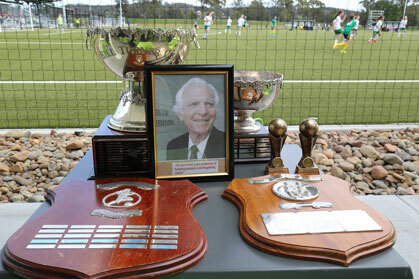 With the demise of the NSW Soccer Federation competition, the year 2000 saw the Northern NSW Schools Soccer Association Inc. introduce the Bill Turner Trophy and Lindsay Hewison Shield. Entries came from Northern NSW, NSW, ACT, QLD and Victoria. Brisbane’s Cavendish Road were worthy winners of the expanded competition, for two successive seasons following on from Canberra High’s 3rd place of 2002. Also 2004 saw a development competition commence in Western Australia. In 1999, Bill Turner was awarded life membership of the NSW Combined High Schools Sports Association. Bill Turner has been involved in school soccer for over 30 years and he is synonymous with the development of soccer at both the school and the elite player levels. In the late 1960’s Bill had a vision to develop schoolboys soccer. To facilitate this development he started organising soccer trials at the local, regional and state level. He also saw the need to develop soccer at the national level and was a founding member of the national schools soccer organisation that continues today as the School Sport Australia Soccer program. Bill and his committee not only organised national championships but commence the international touring program that also continues today. Many legends of Australian soccer were part of this program including Craig Johnston. 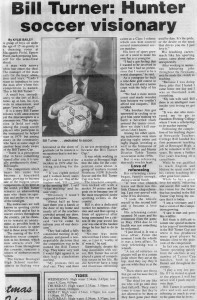 Bill was instrumental in starting the Northern New South Wales Schools Soccer association that not only competed at the National schools soccer championships but were victorious on a number of occasions. Many members of this team went on to represent Newcastle United in the fledgling National Soccer League competition and also Australia. Bill’s vision not only included school soccer but also junior soccer. The development programs Bill commenced were the forerunner of the elite programs now conducted at the regional academies of sport. Bill was one of the founders of the Tasman Cup which continues in the present day as the Commonwealth Bank cup soccer knockout competition. Under his tutelage the Tasman Cup in its heyday drew 5000 people to the finals when they were played at Engelfield Stadium. Bill however will always be remembered for his contribution to soccer in the competition that bears his name: the Bill Turner Cup. In 1979, Bill started this competition with 34 teams. In 1999 the Bill Turner Cup with 738 teams extending from Cairns to Northern Victoria is arguably the largest soccer knockout competition in the world, surpassed only by the FA Cup. Bill Turner’s contribution to soccer encompasses all levels and he is an outstanding recipient of a Soccer sport specific Life Membership of the New South Wales Combined High Schools Sports Association. Bill Turner passed away peacefully on February 22nd, aged 83, following a short battle with cancer. The funeral was attended by his immediate family, as per his request. Bill was a husband, father, grandfather, great grandfather, brother, uncle, teacher, preacher, singer, choir master, wrestler, sports administrator, junior sport developer, international referee, friend and mentor.